I quickly filed away the idea (like, in my brain file, not an actual file; I’m not that organized…) because I knew it would come in handy one day! 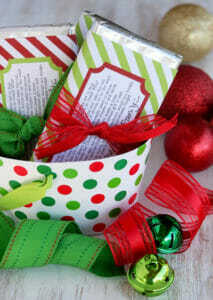 Kim at The TomKat Studio, who made these cute tin can treats labels, and these adorable “Reindeer Food” tags, whipped these up for us too. Thanks Kim! 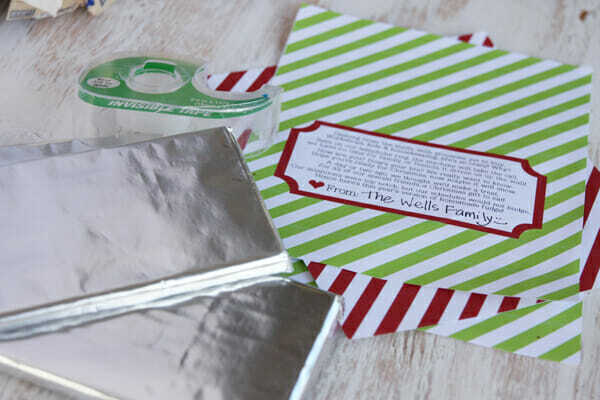 I love her style; make sure to go visit her blog for lots of other fun printables! You can peel off the outside labels that come on them, or leave them on and cover it up. 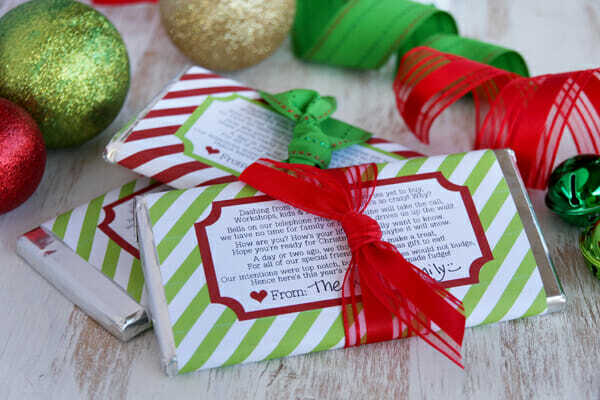 All you need besides chocolate bars is a piece of scotch tape and the oh-so-cute labels. Just wrap and tape. As my six year old would say, “easy peasy lemon squeezy.” Kim even included a cute little spot to personalize them! Well now you can be all ready! I think easy stuff like this is especially great for mail carriers, garbage men, delivery people, etc. When I was growing up, my Mom always gave a little something to all of them and I thought it was so thoughtful. She truly thought of everyone, and found a token-often a simple one, to express her gratitude. Thanks so much Kim of The TomKat Studio for another darling Printable! Click the link below to download and print from your home computer! And come back tomorrow for a recipe! Yep, real food. The kind you can eat. And guess what? There’s no sugar in the ingredient list! I know, it’s a Christmas miracle. There is however a vat of oil for frying, but c’mon, we’re celebrating this week. You can make up for the calories in January when we do an entire month of healthy recipes, okay?! That is so cool and adorable. But do I have to give it away? Ok I have to ask… where did you find your ADORABLE ribbon? Costco! I *love* their ribbons…gorgeous, high quality, and lasts forever! I always stock up around the holidays. Oh my goodness, thank you for sharing this wonderful idea! Like most, I start out with wonderful intentions around December 1; by this point in the month, I’m scrambling just to get the basics done and panicked about all of the “little” stuff I have yet to do. This is a BIG help. Thanks! And Merry Christmas! I absolutely LOVE it!! What could be more fitting as I was getting ready to make fudge! Thank you so much for this!! I was wanting to take a treat visiting teaching, but now I’m sick and my kids are sick and I still have a million things to do! But this is PERFECT!! I love this idea. Almost as easy as My Quiet Dolls and much more delicious! So cute, I love how easy that is. What kind of paper do you print all your printables on? It looks so fancy! Oh, it’s totally not fancy, lol! Just regular ol’ computer paper. Although I think Kim from TomKat Studio uses a nice semi-gloss kind because hers look prettier! So cute. Thanks for sharing that. This is getting bookmarked for sure! Merry Christmas! I love this! I am totally doing this! Your Mom sounds like the sweetest. I want to be thoughtful like that to all the people who serve in the community. Merry Christmas! I love it, this poem is so cute! Thank you for sharing! Really? A whole entire month of healthy in January? Can’t you squeeze in something naughty just once? Or twice? Oh Darn! I bought the “giant” size, that’s wrong isn’t it? Thanks so much for this post! I saw it this morning, bought the candy bars this afternoon and made (and delivered) a small bunch of them to friends/co-workers tonight. So easy, so fun and so cute! Woo hoo! But did you notice that the poem was a spoof of Jingle Bells? It can be sung to that tune, as well. The “How are you…” part has to be sung twice in a row, just like you repeat the line in Jingle Bells. Boy! this is really a great idea. So many times wish we had a little something ready for this certain person coming over. LOVE IT!!! I can’t wait to print them. These are perfect for when a neighbor shows up with a treat who wasn’t on your own list to give to. You always need a back-up plan! Perfect!!! Thank you SO MUCH for the free printables!!! 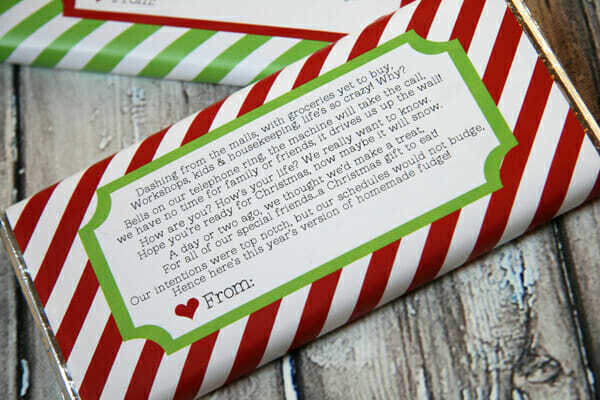 You make what I like to do (remember folks with a simple yet thoughtful gift) easier…and a lot more fun!!! Merry Christmas to you and yours!!! Thank you for a cute idea. I LOVE easy but special ideas! All your printables are so so cute. Would you be able to tell me what software you use to create the designs? Thank you and Merry, Merry Christmas to you both! 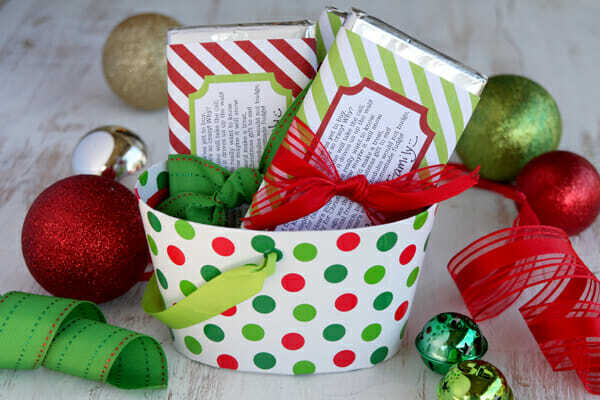 Love the Christmas candy wrappers… Is there any that can be used for birthdays? 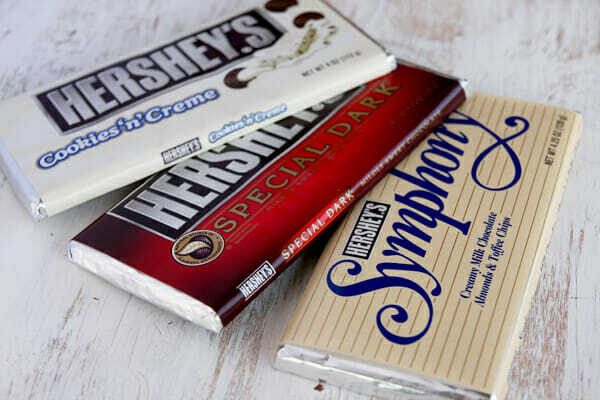 I would like to mention something that I was told by a Hershey executive when I asked permission to print labels for Hershey bars several years ago. 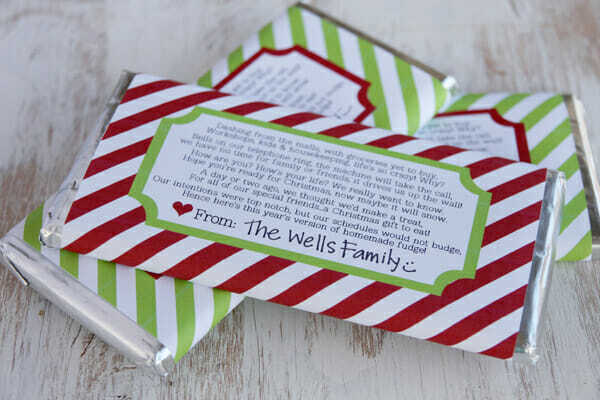 They don’t mind that you place a new personalized wrapper on the bars, but you must leave the Hershey label on the bars. You can check it out, just don’t want to see anyone get in trouble . If you take their label off there could be a sanitation factor also.